If you want to blend in with the shambling hordes, make sure to stock up on the fantastic zombie costume accessories that we carry here. 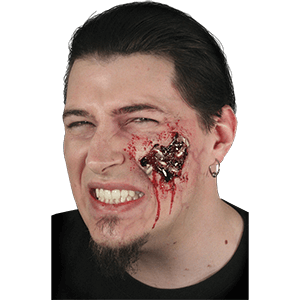 These zombie accessories will transform you into a convincing member of the undead with items like bloody bandages, costume make-up, fake blood, gory wound prosthetics, and zombie wigs. Our zombie blood comes in gel packs, capsules, sprays, and containers as large as a gallon, ensuring that you can create the effect you want. Our latex appliances range from hideous injuries to unsightly rashes to grotesque scars that are sure to make others wince when they see you. We offer zombie make-up in colors that are ideal for mimicking bruises, rotting flesh, and other horrific creatures, as well as the necessary applicators and removal supplies. These undead costume accessories are ideal for Halloween parties, haunted houses, zombie walks, stage performances, and other thematic events. These gruesome accessories are great for other horror costumes, as well. Some bloody bandages are just what the doctor ordered whenever zombies are on the loose. 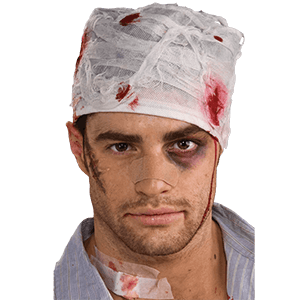 We carry a wide variety of zombie costume accessories, including a range of costume bandages that can make anyone look like the survivor of a gruesome attack. Our gory bandages include bloody arm bandages, bloody head bandages, and bloody leg bandages that you can use in any combination to show the severity of the encounter. Zombie apocalypse survivors are not the only ones who can wear these fake bandages, though, as they also look great on the walking dead themselves! Members of the undead wearing these zombie bandages make it seem as though the victim was turned shortly after being attacked by the horde. We also offer various other horror accessories like zombie surgical masks and zombie dust masks that work great for undead doctors and nurses. When creating your zombie Halloween costume, be sure to include these zombie apocalypse bandages as you finish your look! Zombies hunger for living flesh, which means that the shambling horde often leaves behind plenty of gore. If you want to skip the actual mauling, then the variety of fake blood products that we carry here make great substitutes! 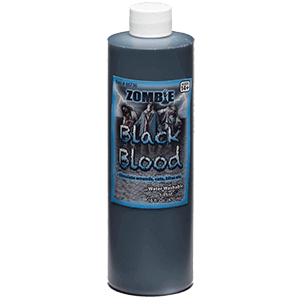 We carry bottles of red and black blood in various amounts, blood capsules, blood gels, blood sprays, and other special effect blood materials that will leave you dripping with ick factor. Our gallon of costume blood is ideal for massacre scenes, while our fake blood capsules can be bitten to create a bloody grin. Whether you are looking for simulation blood that is runny or congealed, we have great options. Our theatrical blood is non-toxic and can be easily washed away with some warm water and soap. Our washable blood works great for movies, stage performances, zombie walks, and costume parties, so be sure to pick some up today! Being dead and generally uncoordinated, zombies often become injured and maimed over time. We offer a number of eerie and horrifying costume prosthetics, fake scars, and latex appliance wounds, all of which are perfect for adding gruesome detail to your zombie look! Some of these fake wounds are fairly typical, like costume scratches, rashes, and cuts, while others are truly ghastly spectacles like slit throats, infected stitches, maggot-ridden gashes, and third-degree burns. Latex injuries are not all you will find here, though, since we also offer Halloween prosthetics like fake noses, fake ears, costume horns, and more. Do not drive yourself crazy trying to create the grotesque look you are going for - instead, choose one of these pre-colored and shaped costume appliances that looks just as good as something home-made with far less hassle. Are you cursed with a head of full, luxurious hair, which constantly foils your every attempt to look zombified? If you answered yes, then our fantastic zombie wigs are the solution to your troubles! 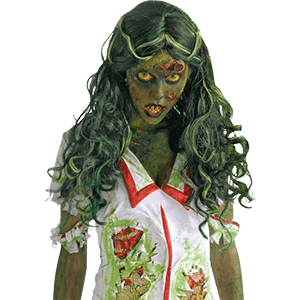 Zombie hair is often grungy, discolored, and matted, an effect that these zombie costume wigs replicate in various forms. These undead hairpieces come in a variety of classic zombie colors like silver, gray, white, and green. Our inventory includes womens zombie wigs and mens zombie wigs in styles ranging from short zombie bobs to long zombie curls. There is no reason to mess with your own hair when creating your look for the next zombie walk, haunted house, or costume party. Instead, find the perfect Halloween wig for your ensemble here! Made a purchase yesterday at 3:45 PM. Received it today. Seriously. Amazing! I will definitely be shopping again!